A short note on the Coen Brothers’ A Serious Man. It seems to me that this incisive fable about one man’s search for answers is the equivalent of the filmmakers handing us the keys to their art. Only now, after 25 years of making movies, have they created an overtly Jewish film. Characters such as John Turturro’s shifty bookie, Bernie Bernbaum, in Miller’s Crossing (1990) and John Goodman’s unforgettable, devout convert Walter Sopchak in The Big Lebowski (1998) now appear as discrete signposts in the oeuvre, wild cards tipping the winning hand the Coens have been playing all along. One gets the sense that this film simply wasn’t possible earlier. Recreating the community environment of their childhood — a pitch perfect evocation of a Jewish American milieu — this film is introspective in a way that probably demanded the artistic maturity of a quarter century of making movies. And also very, very funny, promising propitious return viewings — the hilariously ignoble Sy Ableman has cult potential, as does the saga of the Goy’s teeth; “velly tlloubrring” is set to attain considerable geek exchange value, and the film does wonders for Jefferson Airplane’s “Somebody to Love”, especially in the payoff moment toward the end. Most importantly, it’s a film with real heart. 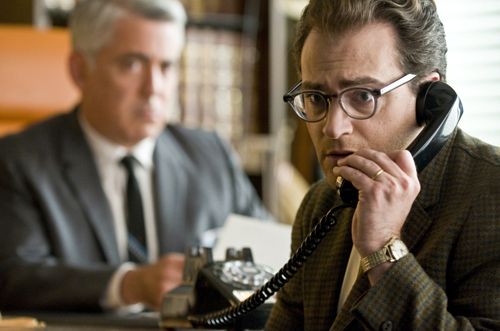 Larry Gopnik, played by Michael Stuhlbarg, is an immensely sympathetic character. His nebbishness is gauged just right for the the story’s drive, but most importantly he is a Mensch faced with real questions. And these are asked with greater clarity, or urge, than in any previous Coen film. An interesting aspect of reception of the recent, great No Country for Old Men (2007), was what seemed like most critics’ wish to deny the murderer, Anton Chighur, his claim for predetermined agency. We wish it were so, but when Gopnik’s phone rings at the end, we understand he came here the same way the coin did.